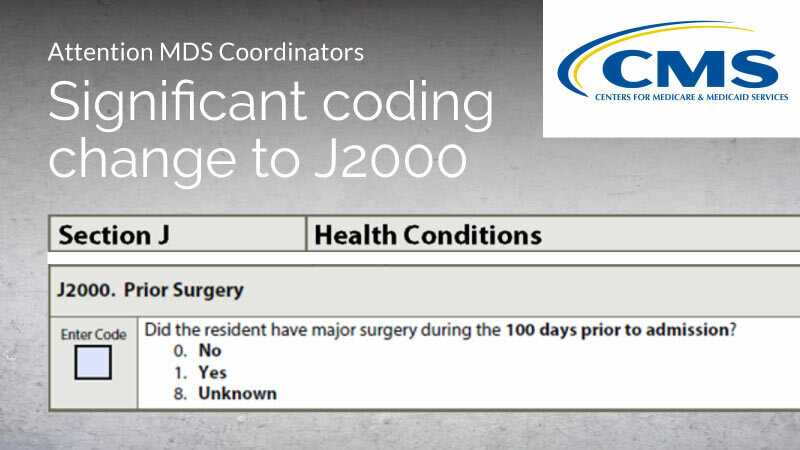 Attention MDS Coordinators: Be sure you and your staff are aware of this significant change to MDS 3.0 coding for J2000 – Prior Surgery. Immediately after releasing the new MDS 3.0 Item Set on Oct. 1, CMS posted a five-page errata document providing notification of a significant MDS 3.0 change for coding J2000 – Prior Surgery. the surgery carried some degree of risk to the resident’s life or the potential for severe disability. The new errata document changes that. Now there are only two conditions for coding J2000. Last week, Mary Madison, Clinical Consultant with Briggs Healthcare, released a blog notifying SNF/LTC providers that the criteria for general anesthesia during surgery has been removed as one of the conditions to code “1. Yes” for this item on a 5-day PPS assessment. Please be sure to notify all MDS staff at your organization of this change. Want more details on the many MDS 3.0 changes that took effect Oct. 1, 2018? Watch our free on-demand webinar featuring industry expert, Ron Orth. And to be sure you receive future updates from SimpleLTC on MDS 3.0 changes and training, please subscribe.